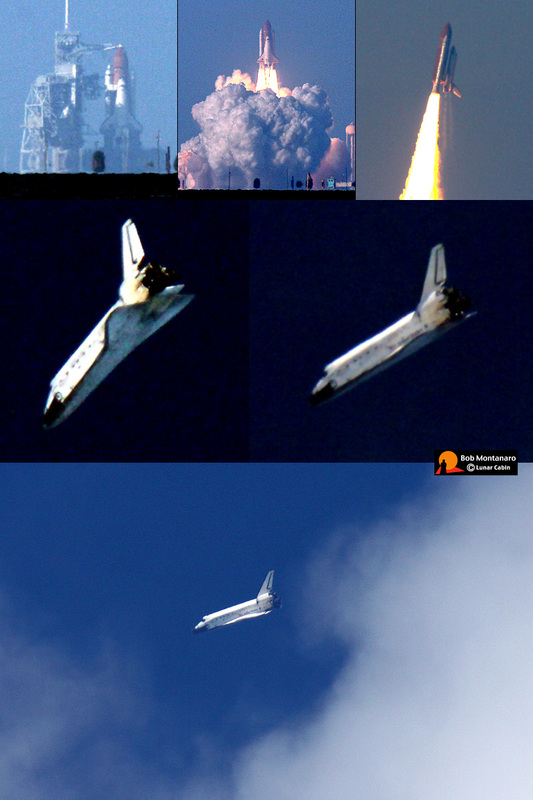 Images of the last flight of space shuttle Discovery on mission STS-133. Discovery’s 39th and final flight took it to the International Space Station where Discovery and its crew of six astronauts delivered supplies and equipment. The flight also carried the converted multi-purpose logistics module Leonardo to attach to the station as a permanent fixture to provide more work and storage space. Discovery astronauts also carried out two space walks to do maintenance and install new components. The images show, along the top, Discovery’s launch on 24 February 2011 at 4:53 p.m. from Kennedy Space Center. Below that are two images taken just moments after the twin sonic booms announced Discovery’s return to Kennedy Space Center to land at 11:57 a.m. on 9 March 2011. Discovery is here seen almost overhead at extreme altitude beginning its sweeping turn to line up with the runway. Below that Discovery is passing through clouds as it continues making the turn.